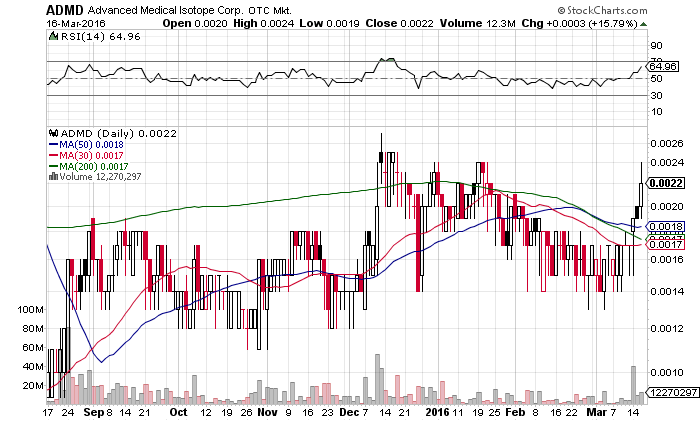 Advanced Medical Isotope Corp. (OTCMKTS:ADMD) stock price has been showing signs of life on recent developments at the company. ADMD has just launch a new solution for the veterinary market. The company is forming a wholly-own subsidiary which will be called IsoPet Solutions Corporation. IsoPet will focus on the growing veterinary oncology market. The new venture will focus on bringing therapy products developed by the company to treat dogs and cats suffering from cancerous tumors. The market size for ADMD new venture is large. Over 150 million cats and dogs and one third of US households own at least one dog and another one third owns at least one cat. According to Animal Cancer Foundation, roughly 6 million dogs are diagnosed with cancer each year and roughly an equal number of cats as well. The average cost of cancer treatment can range from $500 to over $2,000. Assuming that ADMD product can sell for $500 per treatment and 10% of those animals diagnosed with cancer seek treatment. This leaves the market size of about 600,000 for dogs that will seek the treatment. The market for dogs only is $300,000,000 in potential revenues to ADMD new venture. In other recent developments, ADMD has appointed Dr. Alice Villalobos as chair for the veterinary medicine advisory board. The company has been actively seeking partnerships to bring its yttrium-90 brachytherapy products to the veterinary markets and Dr. Villalobos has plenty of experience in the this arena. ADMD is a late stage radiation oncology medical device company. Brachytherapy uses radiation to destroy cancerous tumors by placing a radioactive isotope inside or next to the treatment area. The IsoPet Solutions division is focused on establishing the infrastructure necessary to provide product to veterinary clinics including regulatory clearances and compliance as well as providing product awareness and education to veterinary oncologists. AMDM is currently trading at a $4.5 million market valuation. AMDM had a monster rally in 2015 and looks to be ready to take off again with the announcement of its new IsoPet venture. It has also hired an investment relation firm to create a long-term awareness campaign and boost credibility. We will be updating on AMDM when more details emerge so make sure you are subscribed to Microcapspot so you know what’s going on with AMDM. Disclosure: we hold no position in AMDM either long or short and we have not been compensated for this article.